Tell us about your promotion at The Warhol. I was originally hired as an executive assistant to Warhol director Eric Shiner. To get acquainted with the staff and familiarize myself with the operations of a museum, I navigated through the different departments, interviewing different staff members to get a sense of my colleagues' roles within the organization and their backgrounds that led them to their positions. I was fascinated by the brilliant minds I had the pleasure of working with and decided I wanted to expand my academic study to contribute more to the work that The Warhol does. It was then that I decided to enroll in the M.B.A. program at Point Park University. When Eric Shiner left The Warhol to join Sotheby's as the senior vice president of the New Fine Art Division, Patrick Moore was named director. Patrick is devoted to creating a pathway for staff to achieve their highest professional potential and he began assigning me tasks relevant to my experience in class so that I could apply the tools I was learning to my work at the museum. His leadership has been paramount to my development as a young professional. With the appointment of the new director, The Warhol went through a reorganization that provided an opportunity for me to take on more administrative and financial responsibilities. Senior management offered me a new position as administrative and financial coordinator, which has helped me to grow as a professional and an individual. I am able to apply more of my skills from my courses at Point Park while contributing more to The Warhol as well as the Carnegie Museums of Pittsburgh. Though my position has two primary focuses, administration and finance, I am always happy to get involved in other areas of the museum. I work closely with The Warhol Board of Directors and facilitate the museum's board meetings. I also coordinate internal department meetings to discuss upcoming projects, exhibitions and museum operations. Additionally, I direct external entities to the appropriate staff members who are best suited to address their inquiries. My interaction with visitors also includes conducting gallery talks while facilitating discussions to present Warhol through a different lens. I have have been fortunate to attend some of the meetings surrounding The Warhol's strategic plan and its mission, vision, and belief statements. Lastly, I'm also responsible for processing various budget and expense-related reports. What factors made you choose Point Park for both your undergrad and graduate studies? Originally, I was drawn to Point Park for my undergraduate education because I was involved heavily in dance, music and theater programs and the University has a strong reputation in the performing arts. While I did not foresee myself following a traditional business degree, I was immediately drawn to the SAEM program. The program offered a unique, but sustainable career path that I hadn't come across at any other school. I was interested in learning about the business behind live entertainment and art. 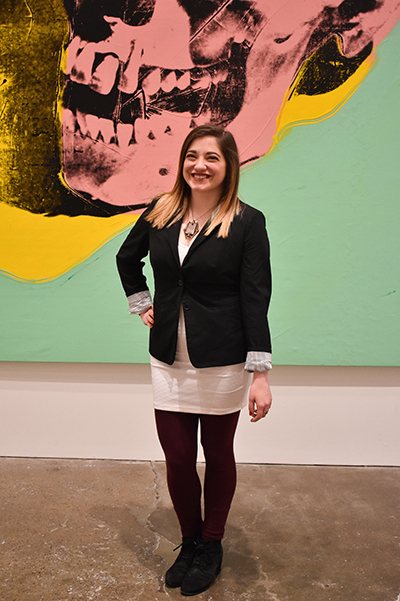 When researching M.B.A. programs, I knew for certain that I wanted to continue to work at The Warhol so I narrowed my search to schools located in the Pittsburgh area. After careful consideration, I decided that I wanted to return to Point Park for my graduate studies. Point Park has professors and staff who I deeply trust and whose opinions I dearly value. My professors are highly knowledgeable and have presented course work that is both challenging and relevant. Point Park was the right decision for me and I am exceedingly grateful for all of the tools that my degree programs have provided me. How have your SAEM and M.B.A. classes helped you in the work you do? Point Park's SAEM program prepares students for work in the arts industry by presenting business concepts through a nonprofit lens. Along with traditional business classes, students are shown how to apply those traditional ideas to creative organizations. I believe that this focused approach to business not only helped me get hired, but also prepared me for a position at The Warhol. My experience in the M.B.A. program has been invaluable. My courses have introduced me to so many new ideas and concepts that have shaped me as a business professional. I am confident in my work and I feel as though my input is valued by my team. Not only have my classes provided me with the information to grow in my organization, but they have prepared me to research and learn independently. What do you enjoy most about working at The Warhol? I consider myself insurmountably lucky to work for such a great place. The Warhol not only preserves, interprets and presents Andy Warhol's life and art, but enriches the community through its programming. The museum also presents Warhol's influence on contemporary culture through its beautifully curated second floor exhibitions that feature a number of live artists. The Warhol is also dedicated to being accessible and inclusive for all visitors and has been recognized as industry leaders for this initiative. However, what I enjoy most about working at The Warhol is having the opportunity to work for and beside such a talented and intelligent group of people. From my first day at The Warhol, I have had the absolute pleasure of learning so much from my colleagues. They have exposed me to new ideas, motivated me to do my best and supported me as I grow in my career.